Coughing may feel like the right way to clear stubborn phlegm and mucus, but in truth it only makes the situation worse. Coughing draws cold, dry, unfiltered air into the airways and results in a huge loss of carbon dioxide. The loss of carbon dioxide causes the airways to constrict as smooth muscle goes into spasm. The cold dry air further inflames, irritates and dries out the delicate mucus membranes lining the airways. Mucus production increases. 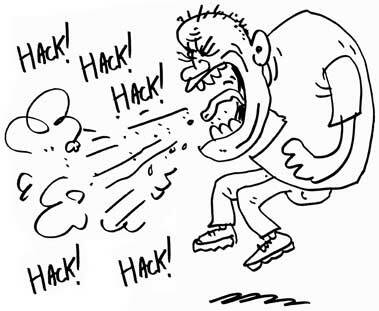 Coughing dries out the mucus making it sticky and harder to dislodge. Frequent coughing is a common symptom of hyperventilation and in particular, habitual mouth-breathing. I was being treated for a combination of asthma/sinusitis/reflux and persistent cough. Since doing the course I am now off all medication, my general health has improved and this winter I have had no colds, flu or bronchitis and I no longer cough all the time. Thanks to Buteyko and the referral from my GP my quality of life is now fantastic.